IT appears the under-35 cohort are behind the demand for synthetic diamonds, drawn not only to the disruptive appeal of the tech-produced stones, but also buying into the image created by synthetic gem companies that their diamonds are free of labour and environmental exploitation. Cheaper to manufacture, laboratory-grown diamonds also fit the budgets of the under-35’s, retailing for between 30% and 40% less than the mined stones. Synthetic diamond manufacturers are increasingly capturing global market share thanks to an aggressive marketing push by the industry. Estimates put the current global market share of synthetic gems at 3%, the Mining Indaba heard on Tuesday. “Many laboratory-grown diamond companies describe their diamonds as being green or eco-friendly and use words such as ‘greenhouse’ or ‘foundry’ to try and influence opinion. They are also being told that [synthetic] diamonds are real diamonds without the human or environmental impact. This is misrepresentation. “They deceive the consumer, because a synthetic diamond is not worth much at retail value. Millennials are being fed lies, because the gap between reality and marketing is huge. Synthetic retailers are winning the marketing battle,” Arslanian Group MD, Sahag Arslanian, said during a panel discussion on diamonds. Ensuring the traceability of mined diamonds was critical to defending their market share, added World Federation of Diamond Bourses executive committee member, Peter Meeus. Leading the charge, diamond producers Alrosa and De Beers have already implemented sophisticated blockchain technology to track stones back to their first point of extraction. For diamond-producing Southern African countries, the threat from synthetic diamonds should be taken “very seriously”, said Namib Desert Diamonds CEO, Kennedy Hamutenya. “We believe that all the players throughout the pipeline should come together and find a solution to this challenge together, much the same way we fought against the image of conflict diamonds,” he said. According to the Diamond Intelligence Briefing, the total annual production of synthetics is currently between eight million and 10 million carats, with gem qualities of about 4.5 million carats. Total annual production of real diamonds are at 124 million carats and offer gem qualities of between 85 million and 90 million carats. Cannacord Genuity analyst, Des Kilalea, is slightly more pragmatic about the rise of synthetics, arguing that they deserve a place at the table. “There’s a fantastic silver lining in synthetics in that diamond miners should look at why they’re mining the smaller, less pure diamonds. Synthetics deserve to take away that market share because they are of lower quality. The miners need to return the value to diamonds by only recovering higher-quality stones,” he said. Diamond producers have already started furiously drafting official definitions for mined and synthetic gems. 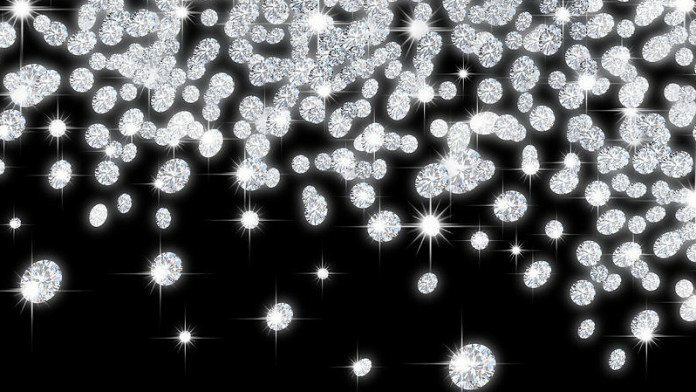 Just last month, nine global diamond industry organisations jointly released the Diamond Terminology Guideline, which will serve as a reference document for the diamond and jewellery trade. The Diamond Producers Association last year also launched its “Real is Rare” marketing campaign, which emphasises the rarity and enduring value of natural diamonds.